Ribbon Cutting by Judge Rene Diaz, with Rev. Glenn and others partners participating and Mr. Lenwood Holmes, Bethel UMC member and project namesake, looking on. 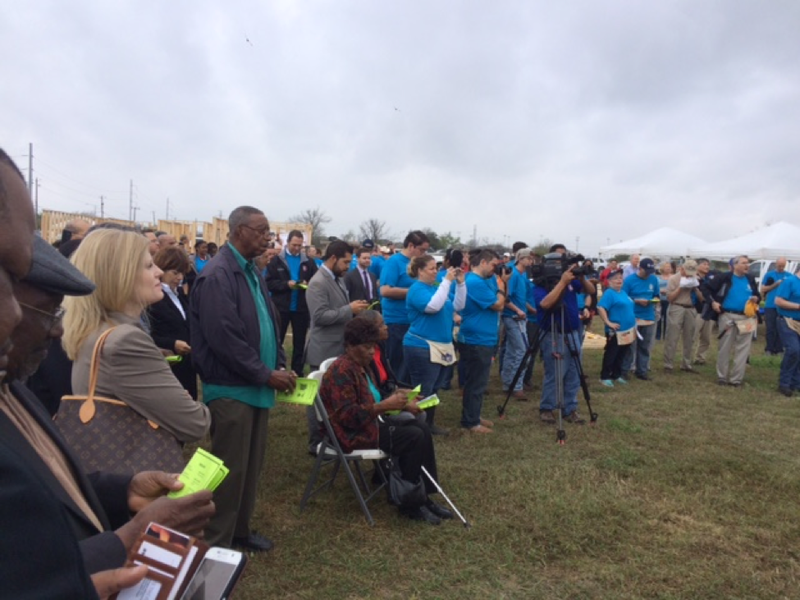 A groundbreaking ceremony was held on Monday for a new housing development in West San Antonio called Lenwood Heights and Bethel United Methodist Church of the Las Misiones District was at the heart of the project. Bethel United Methodist Church has provided the land and has partnered with Habitat for Humanity of San Antonio (HFHSA) and a host of city, state, and government officials, numerous contributing organizations, and a multitude of friends to make this project possible. The pastor of Bethel United Methodist Church, Rev. Robert Glenn, led the dedication ceremony for the groundbreaking ceremony for over a hundred officials, community residents and friends. As a result of this combined effort of generosity and philanthropy, 167 families will receive brand new affordable homes. The families eligible have been the least sought after candidates for home ownership because of their economic profile, sometimes earning as little as $28,000.00 per year. But because of the program offered by Habitat for Humanity, qualifying families will benefit from interest-free mortgages and manageable payments. They will also be required to put in 30 hours of “sweat labor” as a term of their being selected to receive their homes. This year, Habitat for Humanity will celebrate 40 years of service and got its beginning in San Antonio. Since its founding, 947 homes have been provided for families. Judge Rene Diaz, who serves as chair of the Habitat for Humanity’s Board noted that this project “is a hand up not a hand out” as this particular demographic, which might not otherwise have this chance, is given an opportunity to enjoy the privileges of home ownership. The story of the Bethel UMC’s involvement is grace-filled as Natalie Griffith, President and CEO of Habitat for Humanity, shared how she was surveying the Edgewood community for property and drove by this plot of land that is right next to the church. It stayed on her mind, and she later came back, parked in the church parking lot, prayed and decided to check inside. She was met by the church assistant who herself was a Habitat for Humanity resident and who highly recommended a conversation with the pastor. After Griffith met with Pastor Robert Glenn, and consequently the congregation, a plan was worked out where the church provided the property, Habitat for Humanity would provide the program, and the rest will be history. A special sale of the land occurred for the use of the land. Another interesting note is that the church was granted naming rights with Pastor Glenn’s name being the first to be suggested. Instead, he very nobly declined and generously offered the name of a long-time resident of the community and member of the church, Mr. Lenwood Holmes. Streets within the community will be named after additional long time church members and community residents. Rev. Robert Glenn was recognized with a ceremonial street sign named after him at a recent las misiones district meeting on march 15. Bethel UMC, which is itself the result of the merger of diverse congregations, is a very likely church to be at the center of this new community. Pastor Glenn is excited about the prospects for welcoming new families to the congregation and is making plans. The next steps for the project now that the groundbreaking is complete will be to establish the infrastructure. Then the building will proceed in phases over the next couple of years. Most importantly, the Lenwood Heights housing development project is a wonderful example of how a church can partner with other community stakeholders to empower lives and transform their communities.